Welcome to my shop. I am a Melbourne based designer who creates and hand prints designs onto paper and fabric. Most of my designs are nature based and feature Australian animals and plants. 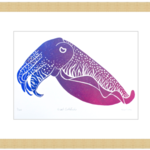 Please have a look at my shop, If you see something you like but prefer a different colour I'd be happy to print it in the colour of your choice. Send me a message to let me know.